This is an exercise in love, an attempt at developing taste, a test of how sweet a word can be, an ode to moments. This is a manifestation of slowness and quiet and sunshine, early mornings and late evenings, glad memories and slender times. This is yearning and giving, an extended meditation on letters, what they can and cannot do for one's being. 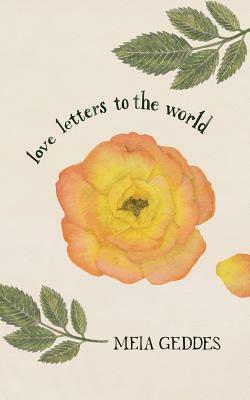 Meia Geddes' debut LOVE LETTERS TO THE WORLD -- a series of 120 lyrical missives -- addresses the world as body, concept, and stranger. This collection is a quiet celebration and exploration of life, love, language, and one's place in the world.